File this under impromptu frockwriter styling. 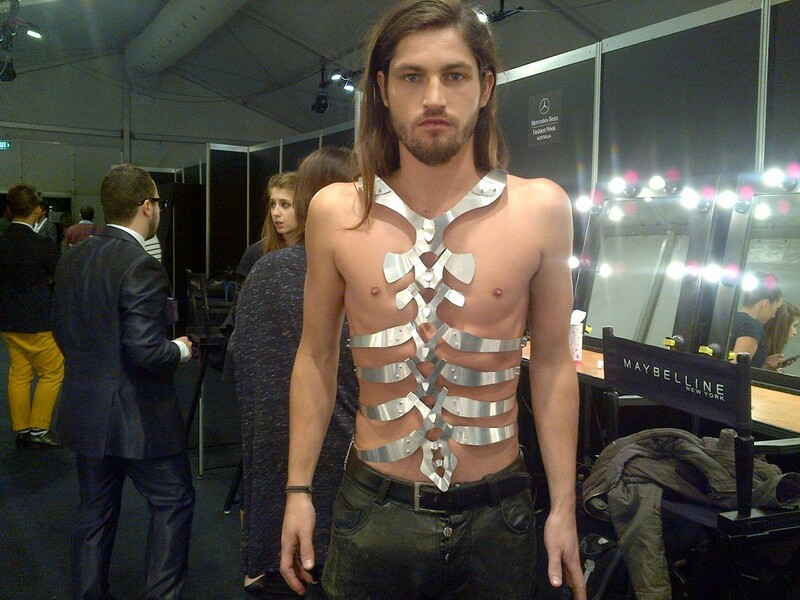 During Mercedes-Benz Fashion Week Australia earlier this month, we were shooting backstage at the menswear group show and couldn't help but do a double take as we walked past Jesus lookalike model Butch Dean being kitted out in a rather spectacular piece of body jewellery. A stainless steel exoskeleton to be precise, or so we christened it, designed by Perth jeweller Alister Yiap and deployed by another Perth-ite, Zsadar designer Shane Newton, to spruce up Newton's segment of the show. We took a shot of Dean - but not before asking for the piece to be turned around backwards, so as to best highlight the design, which is far more discreet from the front (both versions, below). Posted simultaneously on frockwriter LIVE, frockwriter's Facebook and our pop-up MBFWA live blog UNCUT, the shot proved the most popular of all the images we took at MBFWA. Among its fans was Michael Christofis - the Sydney-based designer behind mens' swim- and underwear brand The Navy Diver. So enamoured was Christofis of Yiap's creation, he immediately contacted Yiap and has since used the piece in every single shot of a new promotional series for The Navy Diver starring model Benjamin Gellie. And yes, it's worn backwards. Christofis, as regular readers may recall, has a thing for superhero-looking dudes. The Navy Diver was the first fashion brand to use navy diver and shark attack survivor Paul de Gelder as a model, not only photographing de Gelder wearing his prosthetics, but using photo illustration to accentuate them and turn de Gelder into a veritable cyborg on The Navy Diver website's welcome page. What so grabbed Christofis about Yiap's piece? "I am hugely inspired by theorist Donna Haraway and her concept of the Cyborg - Human and technology relationship" says Christofis. "When I first saw the exoskeleton piece on your blog, it reminded me of the Cyborg that I had developed in my first campaign of Paul De Gelder. I wanted The Navy Diver to continue exploring the concept of the 'Cyborg' and felt that Alister's piece is a perfect representation of what The Navy Diver is all about - Man vs Machine".